A disgraced outcast samurai living in early seventeenth-century Manila, Kitazume is contemplating ritual suicide when a divine force (of a sort) intervenes: Luis, a rogue Jesuit priest and Kitazume’s longtime friend. At Luis’s insistence, the samurai agrees to help smuggle a Manchu princess to Mexico. But little does he know that he’s really been dragged into an epic strug A disgraced outcast samurai living in early seventeenth-century Manila, Kitazume is contemplating ritual suicide when a divine force (of a sort) intervenes: Luis, a rogue Jesuit priest and Kitazume’s longtime friend. At Luis’s insistence, the samurai agrees to help smuggle a Manchu princess to Mexico. But little does he know that he’s really been dragged into an epic struggle for power. As they become embroiled in the deadly politics of New Spain, Kitazume uses his lethal skills to save his friends—and to find redemption. Meanwhile, Luis secretly works as a member of the legendary Shield-Brethren, whose mission is to see that neither China nor Spain controls the silver mines owned by Luis’s very father. As politics and greed collide, Kitazume must call upon his deadly skills once more. But he’s not just fighting to save his friends—he’s fighting for the redemption he so desperately craves. 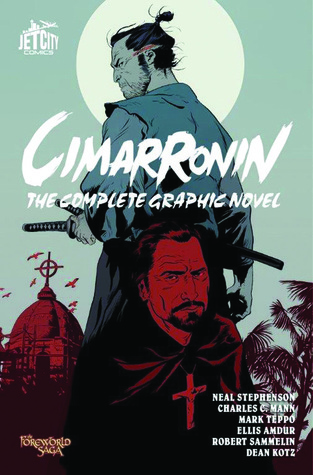 Packed with adventure, twists, and gorgeous visuals, Cimarronin: The Complete Graphic Novel collects Cimarronin: A Samurai in New Spain #1-3 and Cimarronin: Fall of the Cross #1-3.